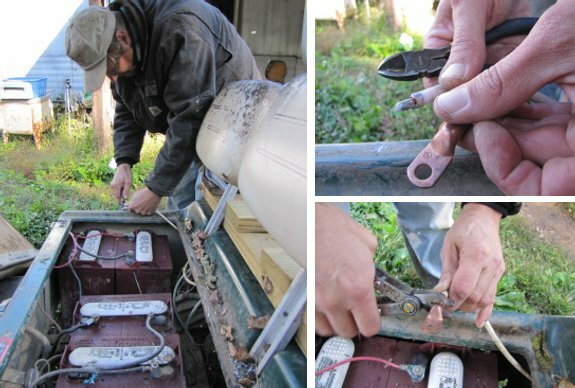 Don't forget to apply petroleum jelly liberally to the terminals of the battery and the connectors. It helps prevent corrosion but does not hinder the current flow. Additionally, using copper connectors on terminals made from another metal can promote galvanic corrosion. I always crimp and solder my connections using rosin core solder. I'm not sure using a Leatherman tool will crimp tight enough for a good connection. If you are desperate enough you could slip a piece of copper tubing over the wire and smash it flat in a vice and drill a hole for the stud. I read somewhere where you shouldn't put anti-corrosive compound between low voltage electrical connections, but I always have without problems. We're thinking of going ahead and replacing all of the cables before too long. This is the second time we've had one break loose, and several are looking quite corroded, so it seems like a bit of prevention might keep us from experiencing another breakdown. What did your golf cart mechanic say about the condition of the wiring (if anything)? If you're going to make the cables yourself, I'd second zimmy's suggestion about crimping and soldering. (That's what my Dad taught me, at least.) And using a proper crimping tool to prevent damage to the wires. When we were working on a solar-powered cart (which ended up as my B.Sc. project long time ago), we soldered and crimped the connectors and then put heatshrink over the connection to try and lessen the amount of movement the cable could have near the connector. Our mechanic didn't mention the state of the wires at all. They had just been replaced when we got the golf cart two or three years ago, but I don't know how long they're supposed to last. Beforehand I'll admit that I'm no expert wrt wiring. But two to three years seems much too short for electrical wiring to last. The electrical wiring in my apartment is several decades old (judging by the colors of the wires used). That might not be fair comparison to a vehicle, but I've got a car that is now 15 years old with the original wiring and never has had electrical problems. Have a look at where the wiring failures are. If they are in the middle of a wire, Check if it rubs against something, or if it is corroded by battery acid. If the failures are where the wires enter the connectors, the connectors could be crimped overly tight. Or the wires might be able to move too much, causing stress concentrations and failures near the rigid connectors. Have you ever seen how you can break a piece of metal by bending it repeatedly at the same spot? Something similar could be happening to the wires. This cable broke apart right by the connector. Since we go over a lot of uneven terrain, I could see how the wires could jiggle around and end up breaking there. Maybe we should find a way to secure them better. Ya since your talking about vaseline or I have also heard using axle grease. Also Thomas Edison used it "mineral oil" in batteries in his day the mineral oil that is. In a pinch you could use baby oil as it is mineral oil based. And it is also used in transformers as it is like a conductor or insulator. So when you are charging your batteries the mist from the acid is trapped in this layer of oil so you don't get the corrosion as much on your cables and connectors and you don't have to fill your distilled water as often also as well. There is a guy who sells a patented de-myster solution. That is on the same principle but he has some other additives his looks more like a dark colored motor oil. I have some old dead golf carts at work I will be experimenting on and trying to rejuvenate and bring the batteries back to life. The epson salts or Mag sulfate or cadmium sulfate product called "Charge it" $19.95 32 oz and $4.95.4 oz bottle for car batteries at amazon.com golf carts need two ounces per cell. So the epsom salts route is definately cheaper. Strange idea's epsom salts, mineral oil, vaseline are used as personal care or laxitives. Who'd have thunk it? Ha LOL! I try to use 4 gauge cables and connecters when I can find them at a good or cheap price. I might try this as an extra part time business since I work at an auto dealership there is no scarcity of old used batteries coming in to test or experiment on. People just bring them in and drop them off on the lot all the time. Just need a few simple tools multi meter/w metal probes, specific gravity tester, load tester, epsom salt, distilled or filtered or purified water. Fascinating ideas, Jimmy! We'll have to give some or all of those a try.